Rotary encoder couplings with clamp attachment. No setscrews to score or pit shafts. Predicted life: Encoder coupling tested in accordance with MILHDBK-5A for infinite life. Material: 2024-T3.5 QQA225/6 aluminum withMIL A8625 Type II black anodize. Insert/insulator: G10 glass filled phenolic. Sizes provided per model table in datasheet. Clamps: Integral at each end, with black oxide finish hex socket cap screws. Grip is secure to peak torque rating of the coupling per models table in datasheet. Peak Torque: Peak Torque per models table in datasheet. Safety factor should be determined consideringacceleration and deceleration loads, etc. CPL Series flexible shaft couplings are carefully matched to the requirements of our encoders and are an excellent, low cost way to protect your investment and avoid equipment downtime. 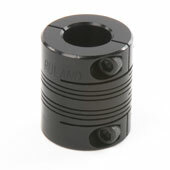 Encoder couplings come in both metric and inch sizes.